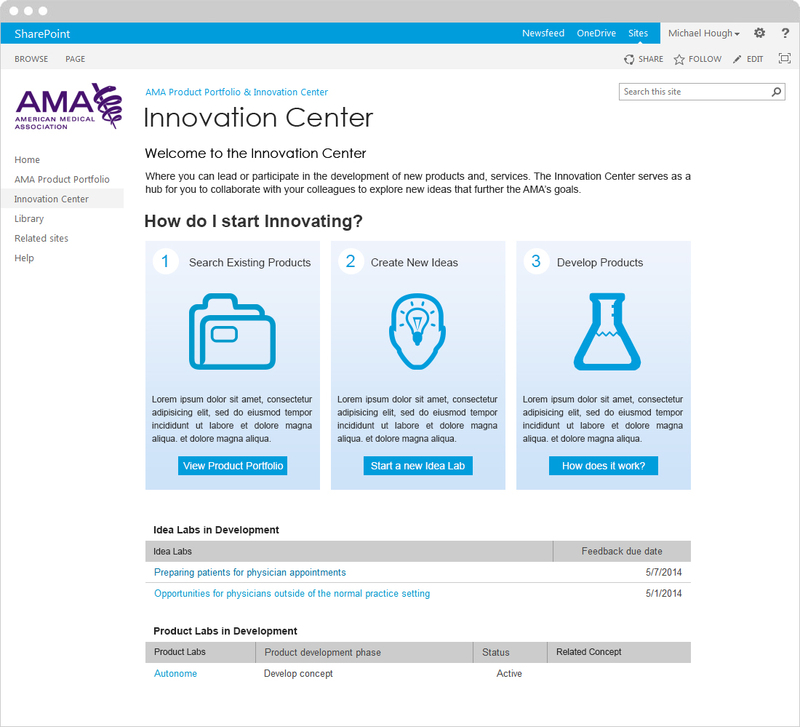 The American Medical Association (AMA) wanted to create an internal collaboration tool called the Innovation Center to be built on their SharePoint platform. I was tasked with the lead design role on this project. I worked closely with a front-end developer, a SharePoint developer, a project manager and 3-4 subject matter experts. Unfortunately for the SharePoint developer I had never designed for SharePoint before. Therefore, my initial designs created a lot of extra work. It wasn’t until we were a week into development that I learned I needed to scale things back. Once we got on the same page we agreed to use several of SharePoint’s default settings in order to reduce development time. 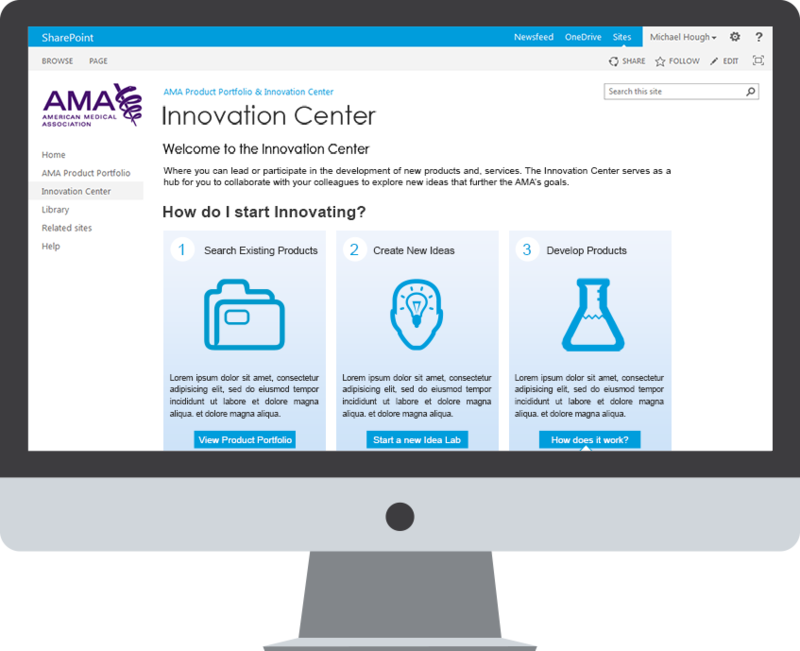 The Innovation Center – This served as the project landing page, project list and help center. 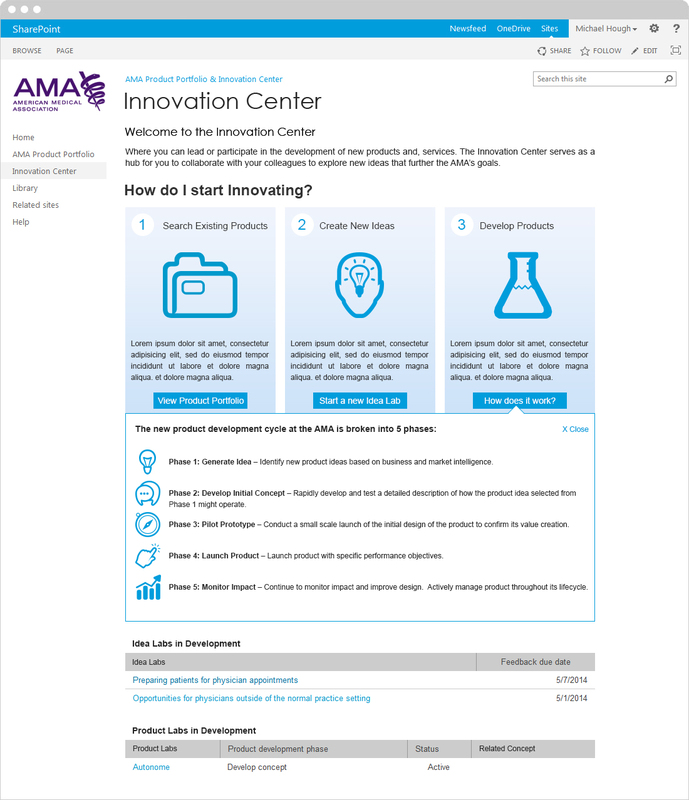 Idea Lab – Users would create, submit, score and decide if an idea was worthy of becoming a new project for the AMA to undertake. 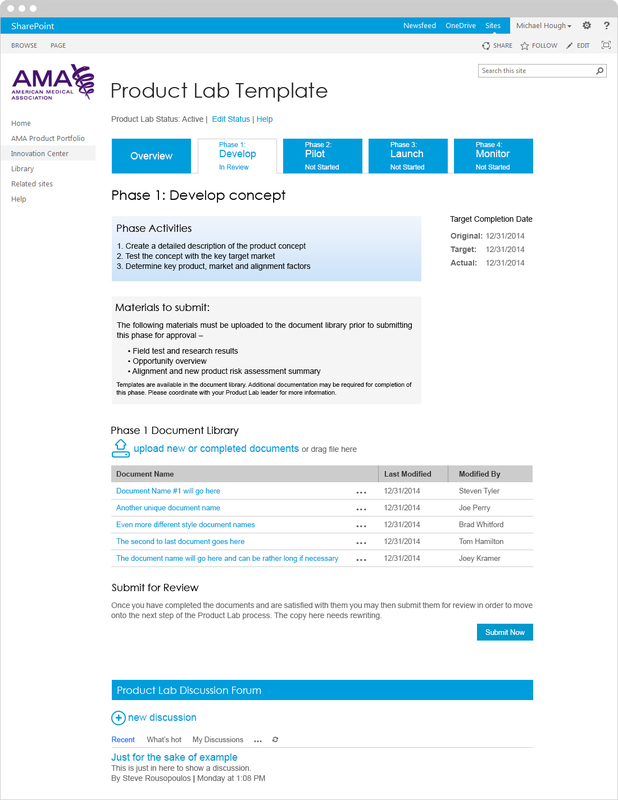 Product Lab – Once an idea is approved it is moved in the Product Lab. This is where an idea becomes a reality and is implemented then tested. Since this was an entirely new project and concept the team held a series of 3-4 kickoff style meetings. We used these to layout our goals and get some basic ideas for the overall process in place. 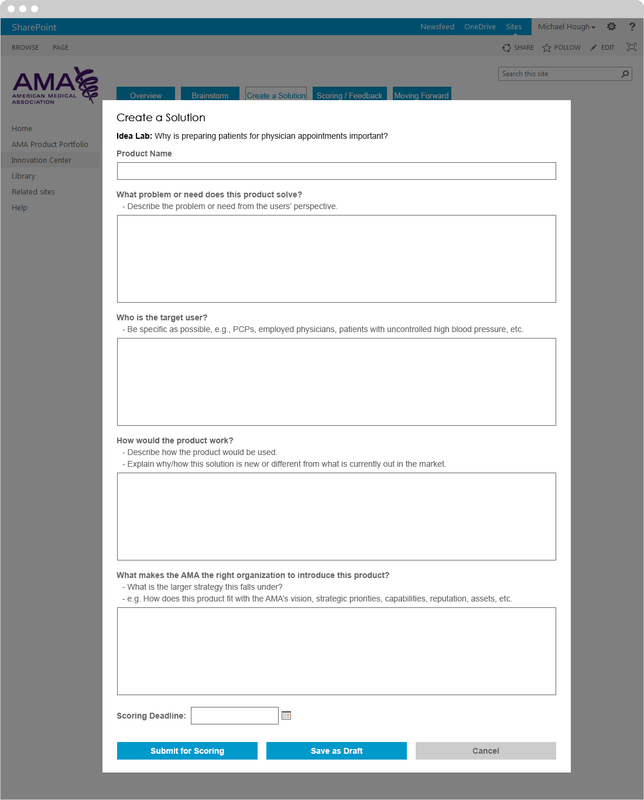 We looked at the way the AMA would create and roll out new ideas and determined which parts of that process we could take and which ones needed improvement. Once I had a basic scope of work in place I sat down with the two developers on the team and we created a series of basic user flows. These flows entailed how a user would create, submit and develop an idea. When we had the basic user flows in place I called for the group to sit down and do some white board sessions. I drew up our ideas, which were then discussed and refined. I then took the ideas and created a series of sketches. I did my best to run through the processes and address the screen layouts. Upon completion and idea approval I went straight to high res visuals. 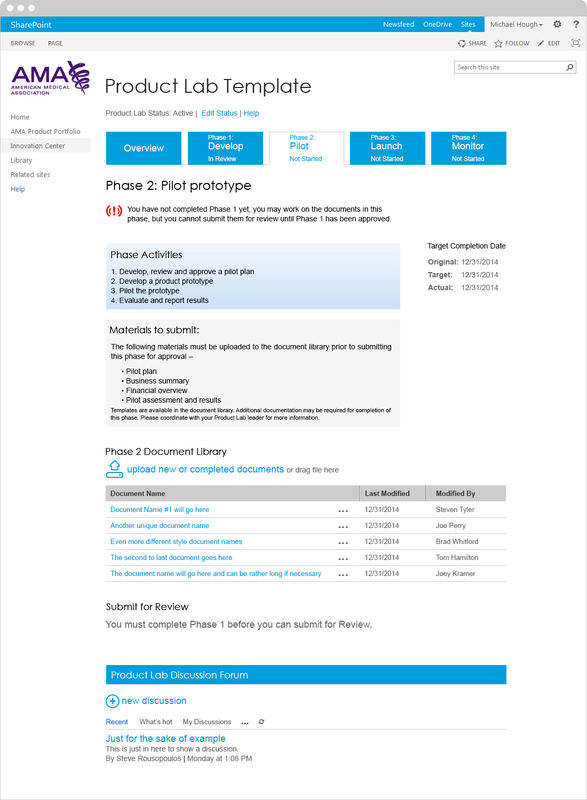 There was no need to create wireframes, as the styles in SharePoint were clearly defined. From there it was design, test & iterate until we got something that looked and functioned good. Dropdown showing the basic processes for the Innovation Center. 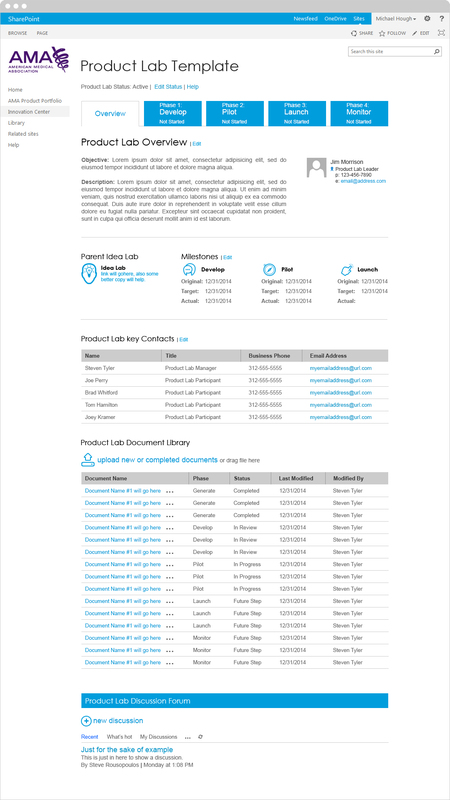 Landing page/introduction to the Idea Lab. The user has the option of creating a new discussion or adding a new solution for review. 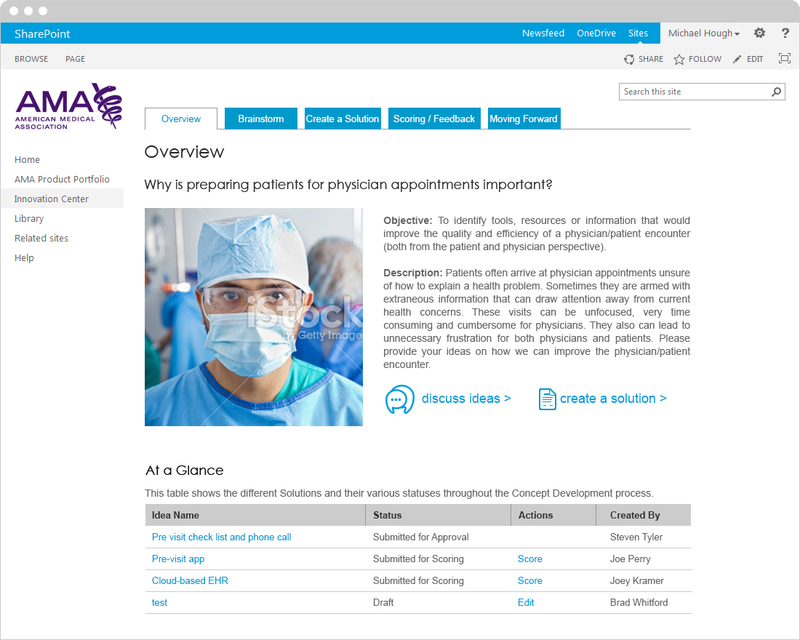 Users can also browse ideas, see their status and select one to add additional input. The first step in the process is to come up with an idea. We looked at this as a forum where users could present and discuss issues. 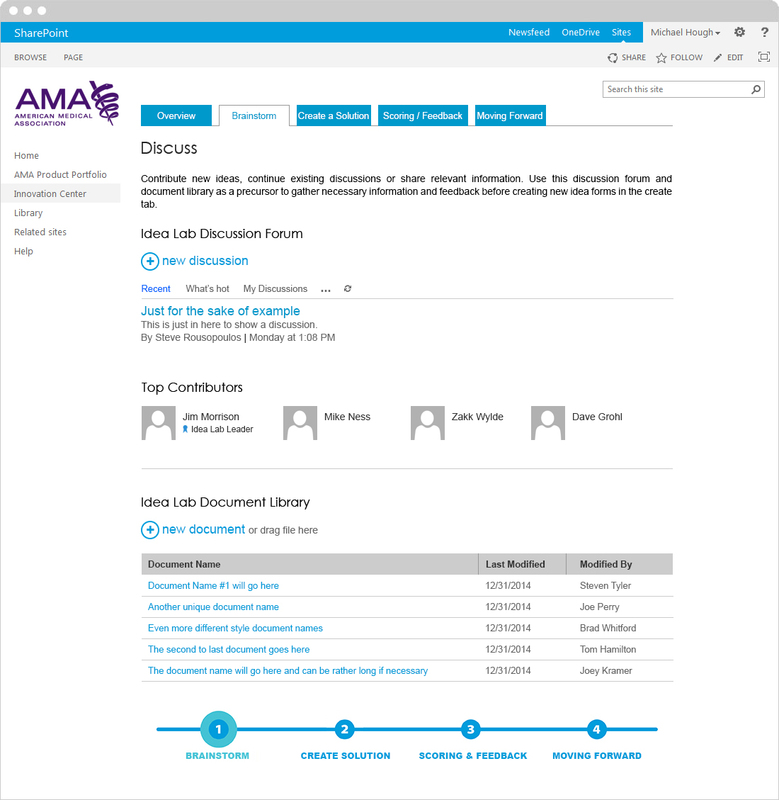 There is a document section where users can upload additional resources for the conversation. Landing page that allows users to create solutions to problems brought up in the brainstorming sessions. 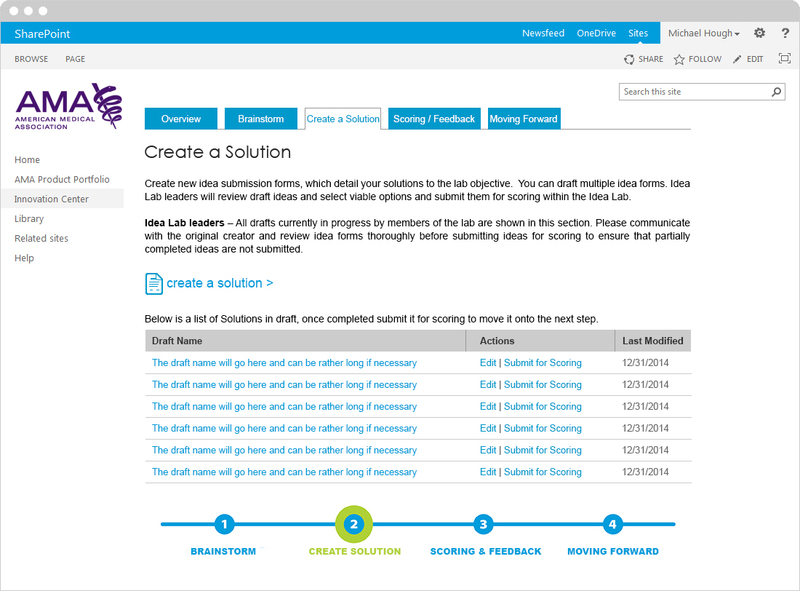 Also, drafts are stored so users have the time to create the best solution possible or edit them based upon feedback. 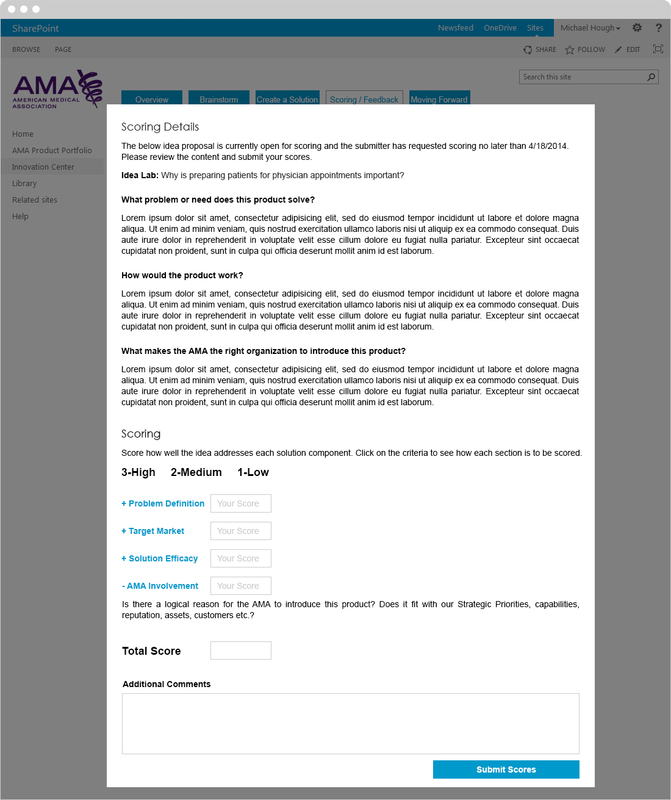 Form users fill out to submit their solutions. Once a solution is finalized it is then submitted to scoring. 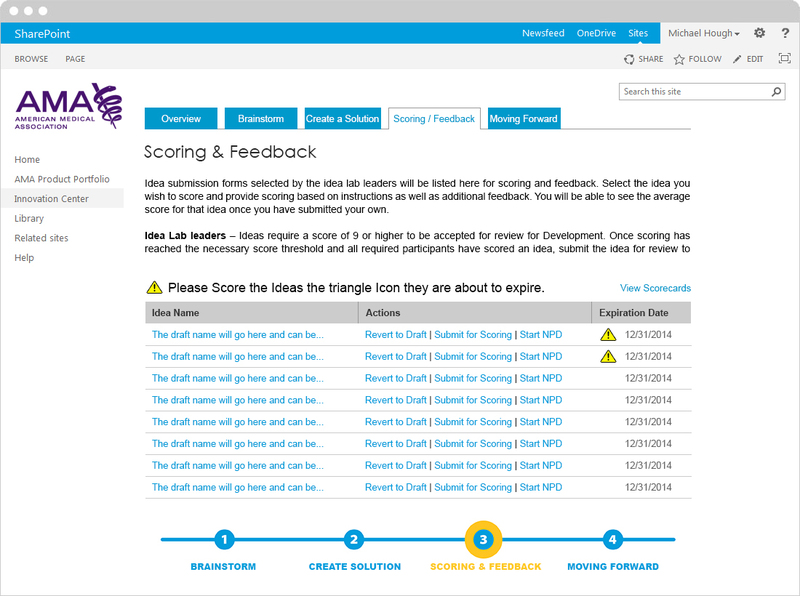 Scoring/Feedback allows other users to review the Solution and give their feedback. A Solution must achieve a certain score in order to move forward. Scorecard users fill out to supply feedback. 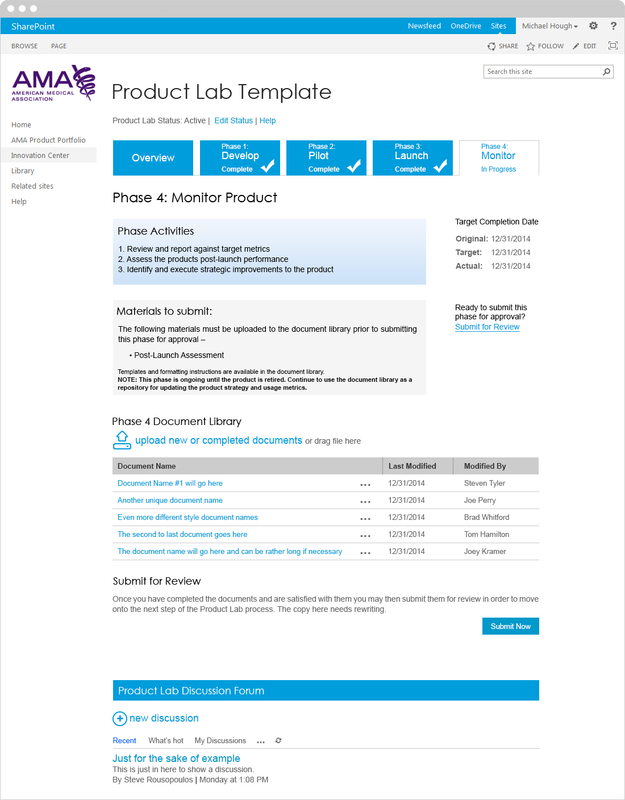 Once a solution is approved a Product Lab is automatically created from the Solution. 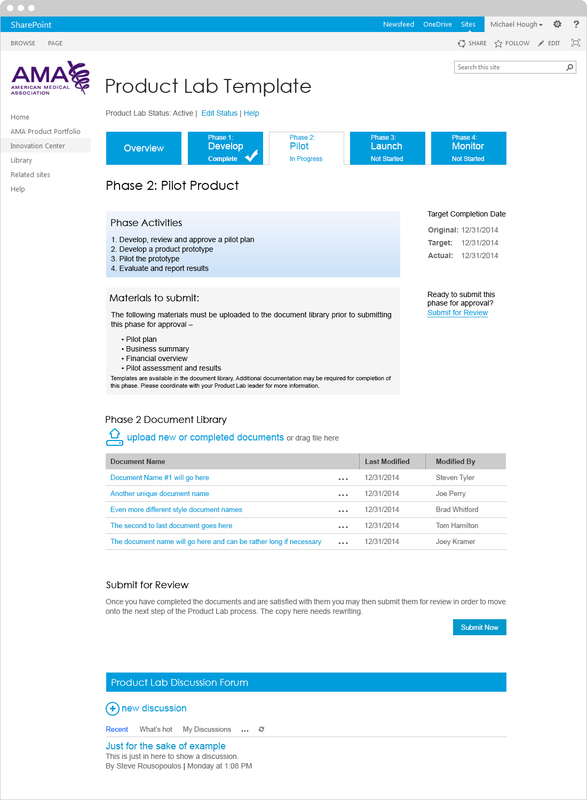 This page stores a list of Solutions moving onto the Product Lab phases. 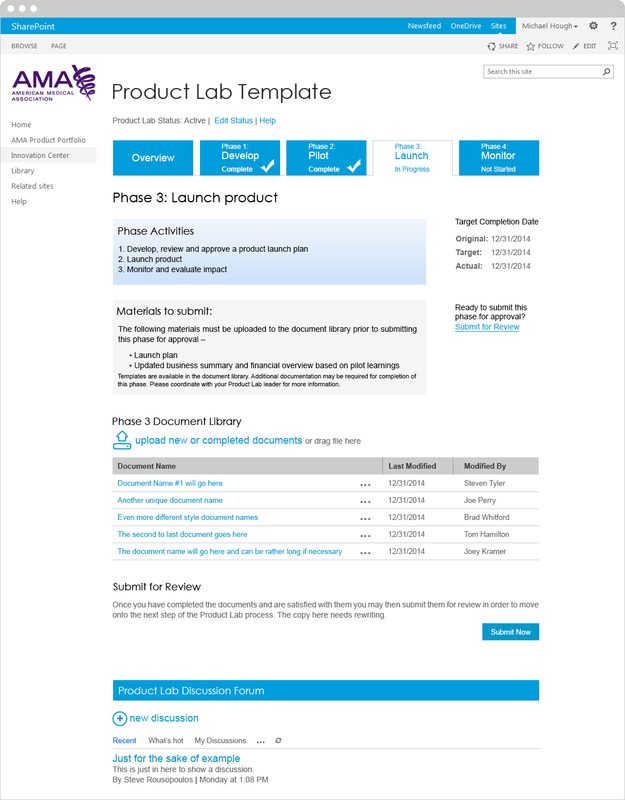 The Overview is the Product Lab phase dashboard for each solution. All elements are automated, for example the Solution creator’s department determines who the default contacts are. However, the user has the ability to make edits wherever necessary. At this point the user must develop the implementation plan for their Solution. They are required to fill out a series of documents they will receive via email. Once the documents have been completed pre-selected administrators submit them for review. 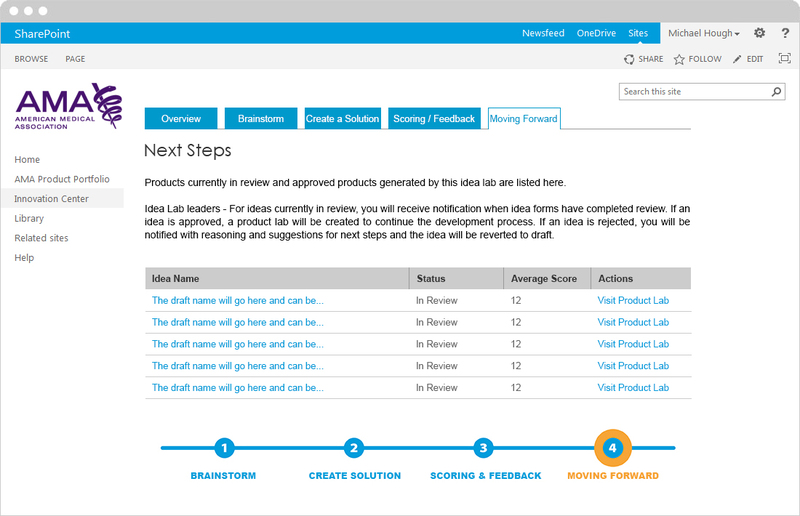 The Product Lab is very linear, the user cannot move forward until each step has been completed. The user once again has a series of documents to fill out and submit for review. This phase is when the Solution becomes reality. The project is launched and watched. The user is required to follow the results of the Launch. They must assess if it was successful and if it becomes a new AMA product. This is the final phase of the Innovation Lab.